Be sure to check out our awesome animal profile on emperor penguins, too! The Falklands’ sandy shores are home to the largest population of gentoo penguins in the world – more than 121,000 pairs were counted here during the last census in 2010! 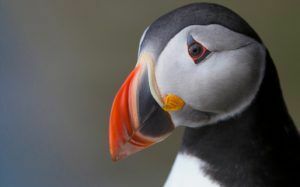 Living on the Falklands all year round, the 76-cm-tall birds are easy to recognise because of the white bar that stretches across the top of their heads, and their bright orange bills. Super-fast in the sea, they swim at up to 36kmph as they dive for fish. Then, when it’s time for them to return to land, they ride the breakers before stumbling onto the beach. We spotted this penguin creche (below) high up on a hill, 2km from the beach! Take a look at the chirpy chicks as they await their penguin parents! Back in 1971 there were just 31 breeding pairs of king penguins at Volunteer Green on East Falkland island, but today there are more than 1,500 – it’s the second-largest and most accessible colony of king penguins in the world. Fortunately, that’s where we’re visiting! Thousands of the metre-tall kings are standing together, their young close by at various stages of development. Some adults have pear-shaped white eggs resting on their feet, others have newborn grey chicks nestled between their belly feathers. Older chicks have grown their brown fluffy down, which looks a bit like sheep’s wool. 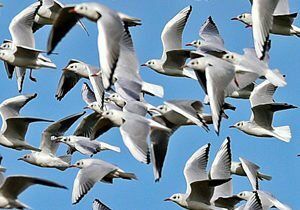 We listen to the raucous call of the adults as they point their bills to the sky and trumpet, advertising their presence. It’s as if the upright, elegant adults are posing for photos, their beautiful orange-yellow necks and bills glowing in the sunshine. Take a look for yoursleves…! Walking through tussac grass and scrubland on Pebble Island in the north of the archipelago, we spot hundreds of holes dotted around the ground. We stop several metres away from one of them and it’s not long before a stripy head pops out – it’s a Magellanic penguin! Magellanic penguins are shy (but noisy!) birds that live in 2m-deep burrows dug into the peat. Named after Portuguese explorer Ferdinand Magellan, these small penguins are strong swimmers. They spend the winter feeding along the Patagonian Shelf, a nutrient-rich region in the Atlantic Ocean, off the coast of South America. Then, each September, they return to the same burrows on the Falklands to breed. Incredible! We had a giggle watching these mischievous Magellanic chicks pestering their mother…! The smallest of the Falklands’ penguins, these spiky-haired birds are wonderful to watch as they hop around the rocks with both feet together! With 320,000 pairs found across the islands, these amazing penguins return to their cliff-top nests to breed each October. We spend hours on Bleaker Island, watching in awe as the noisy parents feed their fluffy chicks regurgitated squid and fish. It might sound yukky to us, but the chirpy chicks love to guzzle it their fishy feast! These punky dudes are the rarest of the Falklands’ penguins and can be difficult to spot when they’re hanging out in colonies of rockhoppers. Both species have remarkable funky crests, but macaronis’ tufts are bright yellow and their bodies are bigger. Bird experts say some macaronis are breeding with rockhoppers, creating a hybrid species! South Georgia, an island 1,500km to the south-east of the Falklands, is home to a whopping three million macaronis, but there are just 24 pairs on the Falklands. What do you think of the penguins of the Falkland Islands? Let us know by leaving a comment below! 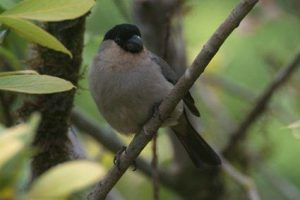 Birds Bounce Back in the Amazing Azores! NG KiDS heads to the Azores to meet a unique winged wonder….